Dynasty Warriors 9 looks to up the ante for developer Omega Force and publisher KOEI, transitioning from the series’ traditional battle-to-battle layout into a bold new open world environment. Those unfamiliar with the series can still tell by the 9 attached to the end of the newest game’s title that Dynasty Warriors has had many iterations, and making a change like this is a huge step into the possible future of a much-beloved franchise. Is something as epic as The Romance of the Three Kingdoms, the story from which the game draws most of its narrative, really improved by a larger-scale world? The answer, unfortunately, is a complicated one, and Dynasty Warriors 9 serves as an indication of what could be coming later in the series rather than the arrival of something innovative and special now. A lot of what Dynasty Warriors 9 has to say about the end of the Han Dynasty in China remains unchanged from previous entries. That’s a good thing, as the game seems to flourish the most when sticking to its roots. As always, players are able to select a specific officer in different armies and relive epic battles from the novel that serves as the franchise’s inspiration. These officers are about as powerful as they come, and much of the game’s difficulty amounts to managing resources, like stamina, wisely. Playing as a given officer grants players access to a wide array of skills, weapon preferences, and more. That means Dynasty Warriors 9 is a game with a lot of replayability, although the shifting perspectives in the story aren’t always that dramatic. 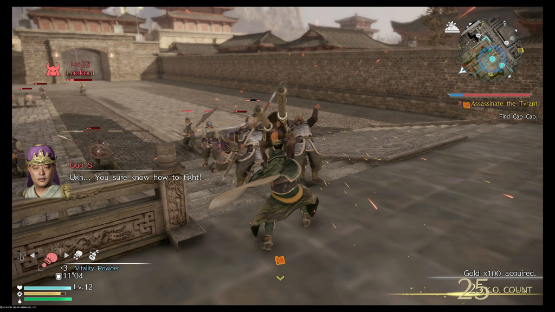 Playing as Liu Bei, my personal favorite character in the franchise, isn’t that much different from playing Guan Yu or Zhang Fei, for instance. They’re the famous trio known as the Peach Garden Oath, and their stories are largely similar with a few exceptions. This isn’t a complain so much as it is a caution. While the game certainly promises a lot of variety, there is some definite overlap. Seeing events through the eyes of one person and then through the person immediately on their left doesn’t change much. The biggest issue with Dynasty Warriors 9 is with the way it implements the new open world gameplay. For a series first, I expected the dynamic, thrilling combat of the franchise to be translated pretty well into a sandbox full of enemies and things to explore. 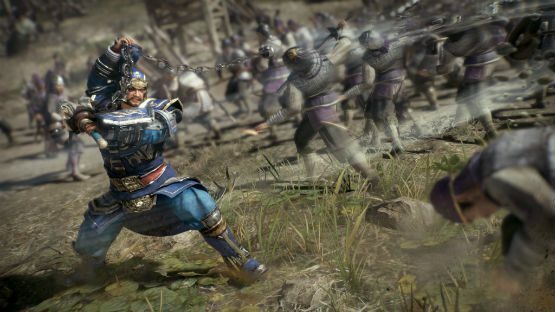 The sandbox in Dynasty Warriors 9, however, is more like a gravel pit. The game’s world is rough in terms of polish, causing at least four crashes on my PS4 Pro in different spots, and can be an annoyance to navigate. Some of the issues the game has as of this writing will be fixed in a day one patch, including a number of ease-of-life fixes to some of the more puzzling inclusions in the open world model. Still, the major problem with Dynasty Warriors 9‘s maps are that they feel devoid of the same kind of passion featured in the game’s battles and storytelling. Riding and fighting on horseback sounds exciting, but it devolves into letting the horse navigate to a waypoint itself or just circling enemy units and swinging a weapon at them. Gathering materials to upgrade weapons and make food is too simplistic; players just need to walk over a glowing orb on the ground and their items are acquired. 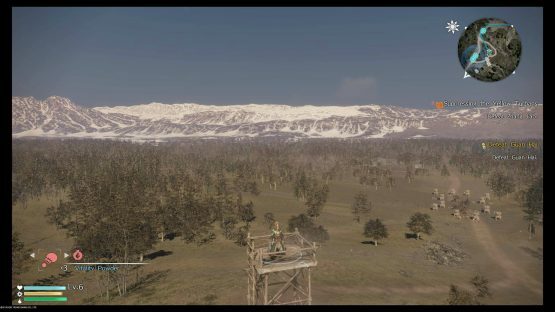 Everything about the open world seems in direct opposition to the rest of the game. Combat is tight and refined, although maybe a little on the easy side before getting into the hardest difficulty modes. The sandbox feature, by contrast, is sloppy and generic. There are some nice elements at play here, as things like a fishing sub-game and fast travel. The constantly flowing battles that occur even while the player isn’t present are also cool, although I never found them to impact my own experience in any meaningful way. Yet, despite these, the main takeaway from the beginning of open world play in the Dynasty Warriors series is that it still has a very long way to go. While Dynasty Warriors 9 is among the least impressive games I’ve played in the series in quite some time, it isn’t without its promise. Most of what hinders it is poor implementation, not actually bad ideas. The open world would be a lot more exciting if enemies didn’t vanish and reappear from my screen as I walked forward a few inches, and if everything were a little more colorful or varied. Likewise, having something to do that isn’t just progressing from battle to battle is exciting, just not when it is a very simplistic fishing sub-game or ramming a horse into inconspicuous crates in the middle of forests to acquire rare items. There’s the chance for stealth elements to be relevant, but it isn’t when the player character can sneak into a castle or just mash one button and send two-hundred heavily-armed dudes flying into the air, never to be seen or heard from again. As it stands, though, Dynasty Warriors 9 is more of a foundation for the next title than the dawning of a new era for the franchise. That’s perfectly acceptable, too, given that series like Dynasty Warriors inevitably must evolve to stay relevant. Right now, there are just some growing pains, and anyone who was interested in the newest iteration because of its new gameplay features would do better waiting for the next one instead.